Hetepheres, wife of Snefru and mother of Khufu. When the sarcophagus was opened it was found to be empty, but the queen had obviously occupied it once since her canopic chest had been used. This chest had four compartments containing the queen’s embalmed viscera, and is the earliest known use of evisceration in the mummification process. This strange situation may be explained as follows: at first, the queen had probably been buried close to her husband Snefru’s northern pyramid at Dahshur, but the tomb had been robbed. The robbers were not completely successful, although they had obviously destroyed the queen's body before the guards were able to rescue the remainder of the burial. It was decided, therefore, to move the burial to Giza, to the more secure area close to her son's pyramid (Khufu probably never knew that his mother’s body was no longer in the sarcophagus). One day, perhaps Hetepheres’ original tomb will be found at Dahshur, since little excavation or survey work has been carried out there. The whole concept of Djoser's funerary monument was that of an area for the spirit, focused on the pyramid itself. This began life as a normal mastaba, but was subsequently subject to several major enlargements, adding one mastaba upon another, until it consisted of six unequal steps rising to 204 ft (62 m). Its base area is 358 x 411 ft (109 x 125 m). The substructure is a honeycomb of shafts and tunnels, several of them dug by robbers which are difficult to distinguish from those original tunnels left unfinished. Vast quantities of stone vases were found beneath the pyramid, many of exquisite form and artistry, a number of them bearing the names of earlier kings. Perhaps Djoser added these vases to his monument as an act of piety towards his predecessors, to save their funerary goods as best he might. A mummified left foot found in one of the passages may be the only remains of the king. Other members of the royal family were buried in some of the shafts and tunnels, one being a young child of about eight years old found in a fine alabaster coffin. The various enlargements of the ground plan of the pyramid finally meant that these other tombs were all sealed beneath its expanding structure with no access. A new entrance to the king's actual burial chamber, cut from Aswan granite and plugged with a three-ton stopper after the burial, was dug from the north. Close to this northern entrance stands the serdab (Arabic for 'cellar'), a box-like structure of finished Tura limestone with a pair of small holes pierced through its front-facing slope. This was found during the excavations of C.M. Firth and was a complete surprise. Within the serdab was a painted limestone, life-size seated figure of Djoser, the oldest royal sculpture of this scale known from Egypt. It represents the king closely wrapped in a long white cloak, probably that used in the king's jubilee or heb-sed festival (p. 19). Food offerings and incense would have been placed on an altar before the two small eyeholes in the wall of the serdab, enabling the ka (the spirit of the king) to partake of the spirit substance - whilst, at the end of the day, the mortuary priests could enjoy the material substance of the offerings. During the old Kingdom Egyptian civilization really came of age. The power of Egypt expanded considerably through the four dynasties it comprised, probably due in large part to the increasing centralization of government and the creation of an efficient administrative system. The concept of kingship changed too, with greater emphasis being placed on the divine nature of the office; the king was considered to be the incarnation of Horus and, from the 5th Dynasty, son of the sun god Re. At the same time, the advances begun in previous centuries - in building, technology, hieroglyphic writing and artistic representation - reached new heights in the Old Kingdom, nowhere more clearly than in the spectacular programme of pyramid construction, which reached its apogee in the 4th Dynasty. 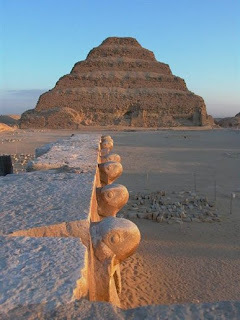 Djoser's Step Pyramid at Saqqara, the Great Pyramid of Khufu (Cheops) at Giza and the famous Sphinx, thought to represent the 4th Dynasty king, Khafre (Chephren), are among some of the most remarkable structures in the world. This prosperity could not be sustained, however, and the 6th Dynasty saw the decentralization of power and an increase in the might of local officials. The Old Kingdom ended, around 2181 BC, in political fragmentation and anarchy. The third king, Nynetjer, ruled for 47 years according to Manetho's calculations. Little happened during most of these: the Palermo Stone records events between Years 6 and 26 of his reign, including various feasts of gods; a 'running of the Apis bull' in Year 9; a military campaign in Year 13 when there occurred the 'hacking up of the city of Shem-Re' and the 'House-of-the-North',- and in Year 15 the birth of Khasekhemwy, next king but one. Manetho also adds that it was decided that women could occupy the throne, but Merneith had apparently pre-empted this in the previous dynasty. The fourth king of the dynasty came to the throne under the name of Sekhemib and reigned for 17 years. During his reign, however, the simmering rivalry between north and south reached boiling point once more, and a period of internal unrest ensued. The conflict was of a politico-divine nature, legitimized in part by the mythological struggle between the two gods Horus and Seth, who fought for control of the kingdom of Egypt. It was of the utmost significance, therefore, that Sekhemib dropped his Horus name in favour of a Seth name, Seth-Peribsen - indicating perhaps that the followers of Seth gained the upper hand. 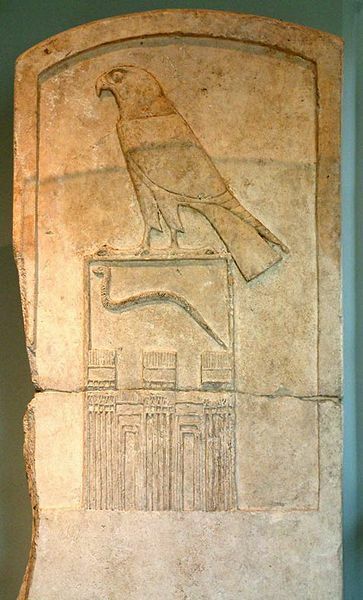 Peribsen's granite funerary stele from Abydos is clear evidence of this change in allegiance, since the falcon above the serekh of his Horus name has been replaced by the animal of Seth, with its pointed ears. A later king, Khasekhemwy, was obviously a religious diplomat because he incorporated the names of both gods with his, and apparently managed to mollify both factions. Manetho inserts three kings between Peribsen and Khasekhemwy: Sethenes (Sendji), Chaires (Neterka) and Nephercheres (Neferkara), reigning respectively for 41, 17 and 25 years. The evidence for these kings is slight and archaeological remains are non-existent. 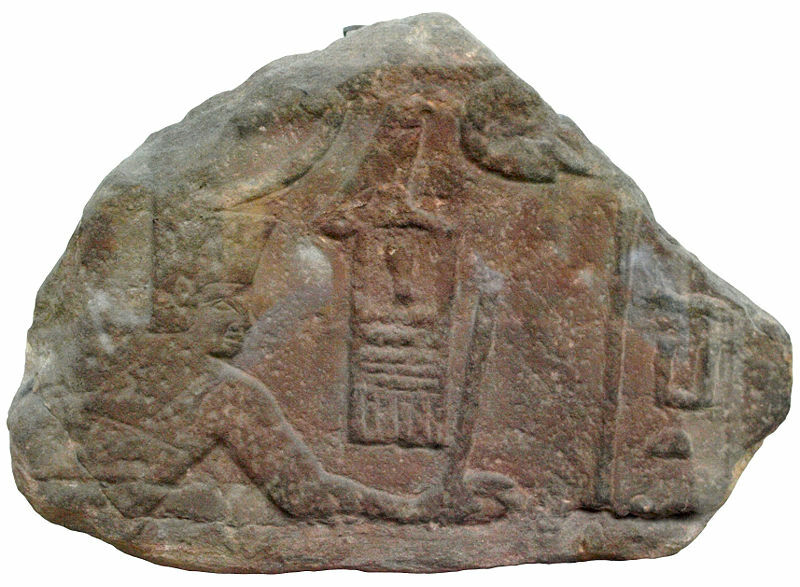 Khasekhemwy was the last king of the dynasty, although some authorities suggest that he had an immediate predecessor with a very similar name, Khaselchem. Others opine that they are one and the same person who reigned for 30 years. According to this theory, Khasekhem changed his name to Khasekhemwy after he had put down various rebellions and thus united the land; meaning 'The Two Powerful Ones appear', the new name incorporated both the Horus falcon and the Seth animal on the serekh. Prior to the restoration of peace, it appears that northern enemies struck south, since an inscription on a stone vase records: 'The year of fighting the northern enemy within the city of Nekheb.' The vulture goddess Nekhbet, shown in the inscription, was the patron deity of Nekheb (now known as el-Kab) - on the opposite, eastern, bank of the Nile to the ancient capital of the southern kings, Hierakonpolis (Nekhen) - and was much revered by the rulers of that city. The fighting must have been desperate if northerners could get so far south and into the capital city. The number of northerners killed is given as 47,209, represented as contorted bodies around the bases of two seated statues of Khasekhemwy. The statues, one of schist and the other of limestone, come from Hierakonpolis and show the king closely wrapped in his heb-sed cloak (p. 19). 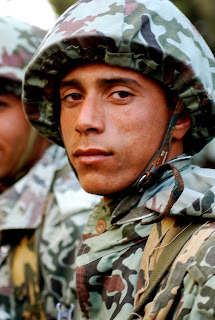 In both he wears the White Crown of Upper Egypt, indicative of his victory over northern Lower Egyptian enemies. They are each remarkable artistic studies at this early period. [Right] One of a pair of limestone seated statues of Khasekhemwy from Hierakonpolis (shared between Cairo and Oxford, p. 26). 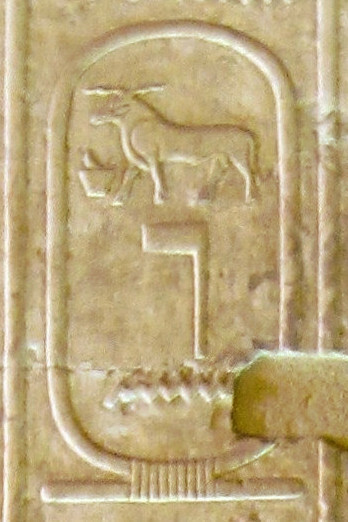 The schematic hieroglyphic inscription around the base records his success as king of Upper Egypt (he wears the White Crown) over Lower Egyptian enemies. Cairo Museum. Khasekhemwy died in about 2686 BC, and his huge tomb at Abydos is unique: it is trapezoidal in shape, 230 ft (70 m) in length and varying from some 56 ft (17 m) wide at one end to 33 ft (10 m) at the other, with a stone-built burial chamber almost in the centre. The robbers missed one prize item in their looting - the king's sceptre of gold and sard, as well as several beautifully made small stone pots with gold-leaf lid coverings. About 1000 yards away from the tomb in the desert at Abydos is the Shunet el-Zebib, a vast rectangular mud-brick structure, 404 x 210 ft (123 x 64 m). Its walls, with their articulated palace facade, are up to 16 ft (5 m) thick and almost 66 ft (20 m) high; they are an incredible survival, being nearly 5000 years old. It is not known what the exact purpose of the building was, much as it may look like an impressive fort. Excavations revealed evidence of complicated internal buildings, and it may have been connected with the provision made for the king's ka (soul) in his tomb nearby. As the dynasty ends with Khasekhemwy so, through him, the next one starts. He apparently married a northern princess to cement the good relations between the followers of Horus and Seth. She was called Nemathap and a jar-sealing gives her title as 'The King-bearing Mother'. Later ages saw her as the ancestral figure of the 3rd Dynasty, much as Queen Aahotep was regarded as ancestress of the New Kingdom. Manetho tells us that the 2nd Dynasty consisted of nine kings, ruling for 302 years, but it is difficult to reconcile his statement with the surviving archaeological and written evidence. According to current thinking, six kings reigned in the 2nd Dynasty, which lasted little more than 200 years. The names and sequence of the first three rulers are inscribed on the back of a statue of a priest called Hotep-dif (opposite). The names are, right to left, Hotepsekhemwy, Raneb and Nynetjer. Hotepsekhemwy is little known. 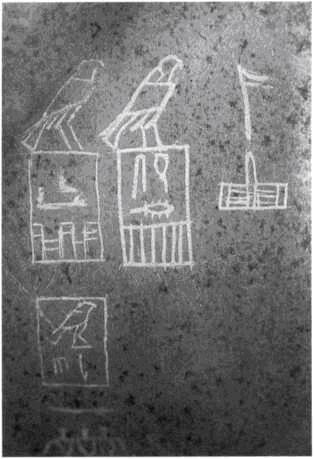 Sealings with his name have been found near the later 5th Dynasty pyramid of Unas at Saqqara and may indicate that the remains of his tomb are nearby. There is no evidence of his having built at the southern site of Abydos like his predecessors. According to Manetho he had a long reign of 38 years, but there is little to show for it. His successor Raneb had a slightly longer reign, 39 years if Manetho is to be believed, but, once again, only the tell-tale sealings in the same area of the pyramid of Unas might point to the location of his tomb. There is a granite stele from Abydos with his name in the usual serekh. 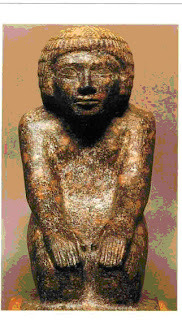 Djer (probably Manetho's Athothis) succeeded Hor-Aha and is said to have reigned for 57 years. Once more, we rely on the evidence of the ivory and wood labels from Abydos and Saqqara for information. The hieroglyphs on all these labels are at an early stage in the development of writing and are often difficult to make out and prevent us from being positive as to their full meaning. One of these - an example in ivory from Abydos - has four lines of characters which include two ships, the sign for town and Djer's name in a seiekh. It appears to record a visit to the northern Delta cities of Buto, one of the early capitals of Egypt, and to Sais, already noted for its temple to the goddess Neith. The other label bearing his name, which is wooden and comes from Saqqara, seems to record some kind of religious event that may have involved human sacrifice. In the early period of Egyptian history, sacrificial (satellite) burial occurred (as at the Royal Tombs of Ur in Mesopotamia), but this wasteful practice was soon abandoned and, much later, mummiform figures called ushabtis were provided to perform the necessary menial tasks required in the next world..
Around Djer's large tomb at Abydos (Tomb O) were over 300 satellite burials of retainers who had gone to the grave at the same time as the principal interment. Some of these were provided with simple wooden coffins and grave markers. Military expeditions were obviously still necessary since a schematic rock drawing near Wadi Haifa shows enemies cast into the water beneath the keel of a ship whilst another enemy is seen tied to the front of an Egyptian warship (just as Ahmose the admiral, son of Ebana, describes in his later tomb at el-Kab; below, p. 97). To one side Djer's Horus name is inscribed within a seiekh. Djer's successor is generally given as Djet (also referred to as Uadji) but it seems possible, to judge from the size (141 x 52 ft, 43 x 16 m) and location of a tomb at Saqqara (no. 3503) and a large tomb at Abydos (Petrie's Tomb Y), that there was a queen who either reigned alone between them or was later regent for a short period. The name on the large stone grave stele found at the Abydos tomb is Merneith, at first thought to be that of a king but later identified as a queen (consort of Djer). Her name has recently been found at Abydos on a clay seal impression that gives the names of the early kings in order from Narmer to Den, confirming her status and giving her the title of 'King's Mother', presumably of Den for whom she may have acted as regent during his minority. Around her Abydos tomb were 41 subsidiary burials of servants, the office of many of them in the queen's service being indicated by the grave's contents. Djet's tomb at Abydos is Tomb Z. The one at Saqqara (no. 3504), for¬merly ascribed to the king and virtually twice the size of the Abydos structure, is now recognized as that of the noble Sekhem-kha, whose sealings were much in evidence in the debris. There was a number of subsidiary (sacrificial) burials made around both monuments, 174 at Abydos and 62 individual burials at Saqqara. Djet's great stone funerary stele from Abydos is a consummate piece of sculpture. The Saqqara tomb of Sekhem-ka (no. 3504) also produced surprises: running round the outer edge of the palace fagade was a low bench with a series of about 300 clay bulls' heads modelled in relief, each provided with a pair of real bull's horns. As previously mentioned (cf. Palette of Narmer, above), the bull was a potent symbol of royalty and it seems curious for it to be found decorating the plinth around a noble's tomb. With the next king, Den (or Udimu), the historical record becomes stronger. There are many labels and inscriptions on stone vases which cite this king and events in his reign. There is also an interesting correlation across to the Palermo Stone (p. 11). We can identify Den (Udimu) via his throne name, Semti, as king of the Two Lands (nsw-bt), with a king in the Abydos King List (p. 11) called Hesepti. From here we turn to Manetho for a correlation with his Usaphaidos with a reign of 20 years. On the Palermo Stone, with its annual records cited via principal events, there are several which tally with similar events known for Den from surviving labels. Those on the Palermo Stone relate to an unidentified king, but run sequentially for 14 years and appear to refer to the later years of the reign. There is a fair probability, therefore, that the Palermo Stone sequence relates to Den, and the subsequent listings to his successors. These we know to be Anedjib, Semerkhet and Qa'a in that order, for they appear thus following Den's (Udimu's) name on an inscribed stone vase from the galleries beneath the Step Pyramid at Saqqara. This sequence takes us to the end of the 1st Dynasty and has recently been confirmed by the sequence given on a clay sealing from Abydos. 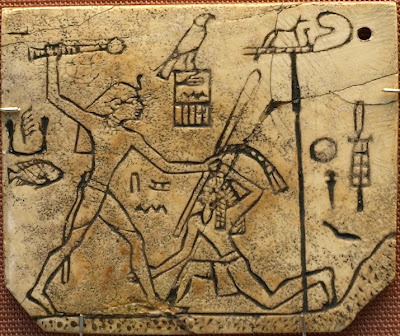 A particularly interesting ivory label from Abydos, inscribed for Den, probably from a pair of sandals, records 'The first time of the smiting of the East' with Den shown, mace upraised in the classic pharaonic posture (p. 18), clubbing a foreign chieftain. This appears to correlate with the 'Smiting of the Troglodytes' recorded on the Palermo Stone, as the second year within a sequence of 14 years of an unidentified king. Professor W.B. Emery found a tomb (no. 3035) at Saqqara in 1935 that, despite the numerous jar sealings present of Hemaka, the king's great chancellor, was at first thought by many to be the tomb of the king, Den, by virtue of its great size and the magnificent finds. The tomb has now been reassigned to Hemaka. Although much destroyed, the collection of objects recovered, the largest group of excavated Early Dynastic material, was of supremely high quality. 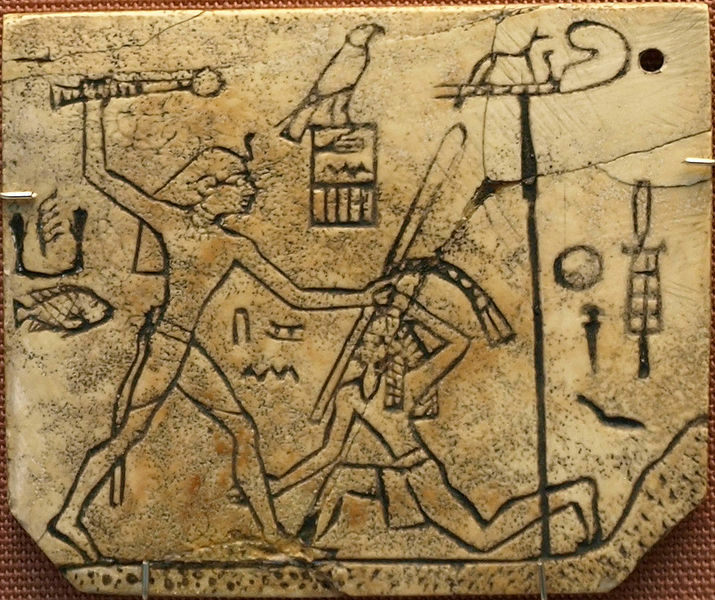 Ivory label of Den from Abydos showing the king, with uplifted mace, smiting an Asiatic captive. He is identified by his Horus name in a serekh above the unfortunate foe. Note the Anubis- topped standard that precedes the scene. British Museum. Den's Abydos tomb (Tomb Z, 62 x 49 ft/19 x 15 m) was much smaller than the Saqqara tomb previously ascribed to him (185 x 83 ft/56 x 25 m) and it had 174 satellite burials around it. On the grounds of architectural similarity, Emery considered that a badly destroyed tomb found at Giza, almost as large as Hemaka's at Saqqara, and which had the graves of sacrificed servants around it, might be the tomb of Den's queen, whose name is not known. The next king of the 1st Dynasty reigned for 26 years, if we identify Anedjib with the Miebidos of Manetho. There is some evidence at this period of a dynastic struggle, of north versus south. Anedjib seems to have come from the area of Abydos known as This and is recorded as a Thinite king on the Saqqara King List from the tomb of Thunery (p. 12). Many stone vases bearing his name had their inscriptions erased under his successor Semerkhet, who was himself omitted from the Saqqara List. The Saqqara tomb of the noble Nebitlca, previously ascribed to Anedjib (no. 3038), has an interesting architectural feature, also present in the earlier Saqqara tomb of Queen Merneith. Concealed within the normal rectangular palace fagade mastaba was the base of a stepped structure, a curious juxtaposition of two quite different forms. (Mastaba is an Arabic word for 'bench', given to the early tombs since their low flat form resembled the bench found outside the door of village houses.) Possibly here, and in the tomb of Merneith, we have the beginnings of Anedjib's tomb at Abydos (Tomb X) is one of the worst built and smallest amongst the Abydos royal tombs, a mere 53% x 29Vi ft (16.4 x 9 m), although it had a burial chamber constructed entirely in wood. The surrounding 64 graves of retainers were also of low standard. 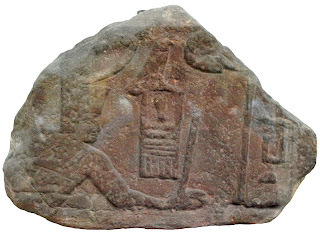 Detail of a schist fragment inscribed with the names of Qa'a and Semerkhet, preceded by the sign ntr (god) within an enclosure fence. Cairo Museum. The next king Semerkhet, reigned for nine years according to the Palermo Stone, or 18 according to Manetho, who notes that there were numerous disasters during the reign. These may have been connected with the problems in relation to his predecessor, it having been suggested that Semerkhet was in fact a usurper because he erased the name of his predecessor from stone vases and was himself omitted from the Saqqara King List. His tomb at Abydos (Tomb U) measures 95 x 1013/t ft (29 x 31 m) and is vastly superior in size and quality to that of his predecessor, with its brick-lined burial chamber and the well-built servants' graves. Unusually, no large tomb has been identified at Saqqara to his reign. The last king of the 1st Dynasty, Qa'a (Qa'a-hedjet), may have reigned for 26 years, but Manetho's name of Bieneches, whom he gives as the last king of the dynasty, hardly equates with Qa'a. A large tomb found at Saqqara by Emery in 1954 (no. 3505) was ascribed to Qa'a, but we now believe it to be that of a priestly noble, Merkha, whose large limestone stele giving his name and titles has one of the longest texts extant from the period. The size of the tomb, 213 x 121 ft (65 x 37 m), was such that it led Emery to suggest that Merkha had been granted the honour of burial close to his royal master. The superbly carved limestone stele of Qa'a shows the king embraced by the falcon-headed god Horus. 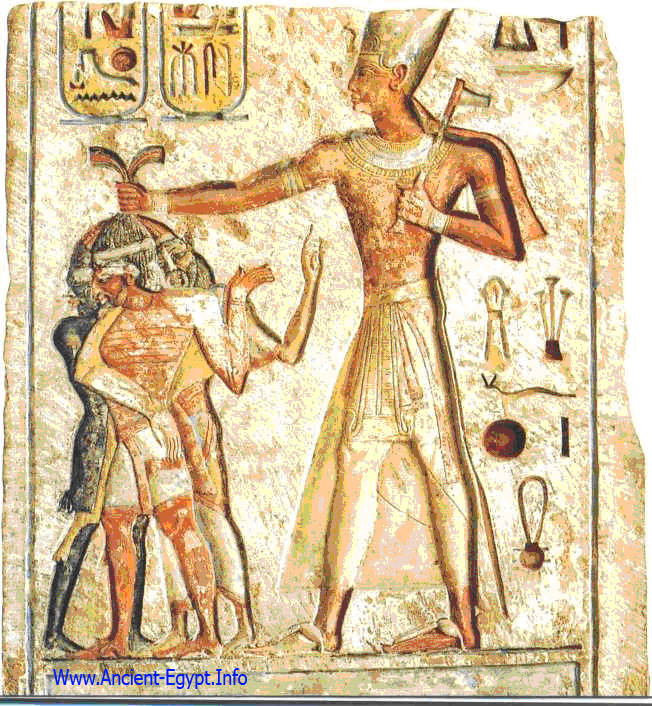 It probably came from Abydos since so fine a stele must surely have been associated with the king's tomb. Louvre, Paris. The large tomb of Qa'a at Abydos (Tomb Q) was re-excavated in 1993 by the German Archaeological Institute, Cairo. They revealed that the tomb had been subject to numerous alterations and enlargements, starting from a simple brick-lined burial chamber. Small by Saqqara comparisons, only 98‘/2 x 75Vi ft (30 x 23 m), it also had a lesser number of satellite burials, only 26. It is notable that the practice of satellite (sacri¬ficial) burials seems to have stopped in Qa'a's reign in the north, although some are still present, but not in such vast quantities, in the south at Abydos. 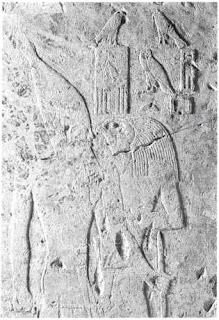 Petrie assigned the tomb at Abydos to Qa'a not only from the usual jar sealings but also from two fragmentary stele he found on the east side of the tomb that gave Qa'a's Horus name in a serekh. A superb limestone stele of the king acquired by the Louvre in 1967 shows him wearing the tall White Crown of Upper Egypt and embraced by the falcon-headed Horus. 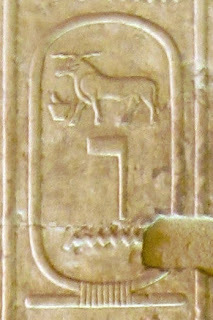 The White Crown also forms part of his name within the serekh above the two heads, possibly indicating the final triumph of the south, Abydos. 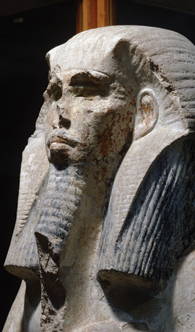 A change of dynasty normally indicates a break in the line of the ruling house, yet Manetho tells us that the kings of the 2nd Dynasty also came from This, being Thinite kings, from near Abydos, as were the last kings of the 1st Dynasty. Hor-Aha's greatest achievement was the founding of the capital city at Memphis, just south of the apex of the Delta. This was to endure throughout Egypt's history and become one of the greatest cities of the ancient world. The site was obviously chosen initially for its geographical and thus political importance in a newly unified country, rather than its situation as a good building site, which it was not. Herodotus records (Bk 2: 99) that Menes dammed the Nile just south of the future site of the city, diverting it so that he could build on the reclaimed land. A strict watch was kept on the dam - the Persians, he said, strengthened it every year because, should it be breached, Memphis would have been overwhelmed. Recent deep soundings taken by the Egypt Exploration Society expedition to Memphis have shown that the course of the Nile has been gradually moving eastwards in historical times. 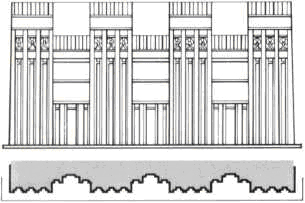 The seiekh used for royal names represents the 'palace fagade system of panelled brickwork, seen here in elevation and plan views. According to Manetho, Hor-Aha (there called Menes) reigned for 62 years and met his end when he was carried off by a hippopotamus. He must have been of a great age and presumably out hippopotamus hunting. The Palermo Stone records a hippopotamus hunt in the reign of Udimu (Den), later in the dynasty, and their savage attacks on crocodiles are represented in a number of reliefs in later Old Kingdom, 6th Dynasty tombs. After Memphis was founded the early Egyptian kings began to construct their tombs at the sacred site of Abydos in middle Egypt and the nobles theirs on the edge of the desert plateau at Saqqara, overlooking Memphis. Controversy has raged as to whether the king built at both sites. Archaeological evidence is quite scarce with regard to specific attributions since the structures at both sites were badly damaged and heavily robbed throughout the ages. Those at Abydos were literally ransacked by the Frenchman Amelineau and much evidence destroyed at the end of the last century. Flinders Petrie took over the re-excavation and recording of the site, recovering plans of the early substructures and the meagre yet often important leavings of the earlier robbers, such as the wood and ivory labels referred to. Professor W.B. Emery excavated the Saqqara site, mainly between 1936 and 1956 (except for the war years). He, likewise, found only pitiful remains of once fine funerary provision. The tombs at Abydos and Saqqara are not decorated, so evidence of their owners can come only from material remains, largely in the form of seal impressions, rolled out from cylinder seals on the wet clay stoppers of wine jars and the like. They may have the name of the high official responsible for the burial, on occasion a royal name, but it is not necessarily that of the tomb's occupant. In the light of recent analysis of the clay sealings, and the re-excavation of a number of the early tombs at Abydos by Professor G. Dreyer of the German Archaeological Institute, Cairo, Egyptological opinion now favours Abydos as being the site of the royal tombs. At Abydos there is also now recognized from the later Predynastic Period a sequence of tombs that leads into the early royal tombs and their evolution can be traced through the succeeding reigns. The large tombs at Saqqara are those of the nobles of the period; so mighty were some that it would seem they could, in several instances, emulate their royal masters and have satellite (sacrificial) burials associated with their tomb. 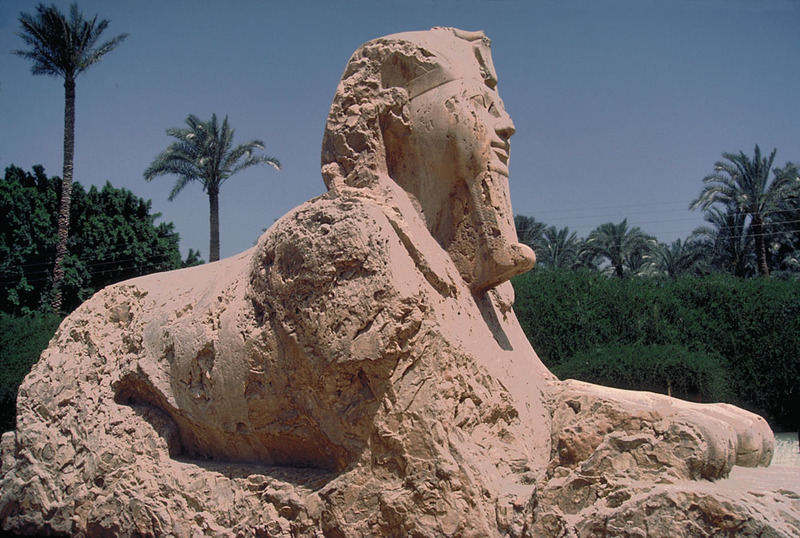 Alabaster Sphinx : The Alabaster Sphinx of King Tuthmosis III This sphinx is found in Memphis, the oldest capital of Egypt. 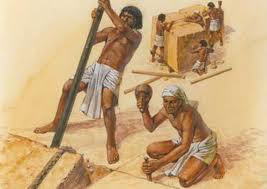 The city was built by King Menes (Narmer) around 3000 BC, and lies 24 kms southwest of Cairo in Al - Badrasheen. Also found here is a beautiful statue of Ramses II (exhibited in a small museum) and the Temple for Embalming (the Sacred Apis Bull). 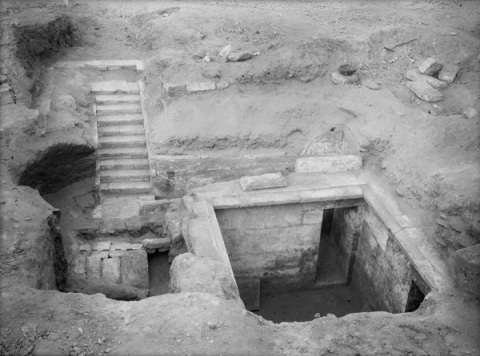 In the early cemetery at Saqqara, Emery located a large rectangular tomb (no. 3357) that he ascribed to Hor-Aha (but his tomb is now B 19 at Abydos). It had 27 storerooms at ground level for funerary equipment, and five rooms below ground. The mudbrick exterior was panelled all round in a style referred to as the 'palace fagade', which it resembles. This was to be copied later as a decorative element in jewellery (it is the lower half of the seiekh, p. 18) and for the first time in stone nearby in the 3rd Dynasty complex of Djoser (p. 34). On the north side of the structure, a brick-built pit had once held a wooden solar boat. At Abydos, in October 1991, a fleet of 12 boats dating from about 3000 BC were found buried side by side. The boats - the oldest surviving large-scale vessels in the world - were up to 100 ft (30 m) in length and their superstructures had been protected by mudbrick structures protruding slightly above the desert surface. Several individual, and now empty, boat pits were later provided around the Great Pyramid at Giza in the 4th Dynasty and one discovered there in 1954 was found still to contain a wooden boat (p. 49). All these boats and boat pits were presumably connected with royal funerary ritual, although their precise function remains unknown. Hor-Aha's tomb at Abydos (B 19) is the largest in the north-western section of the cemetery, and another tomb close by produced small labels with the name Berner-Ib, literally 'Sweet-heart'. It is possible that the lady was Hor-Aha's queen, and her name also appeared on items from Naqada, the site of the great tomb of his possible mother, Queen Nithotep. 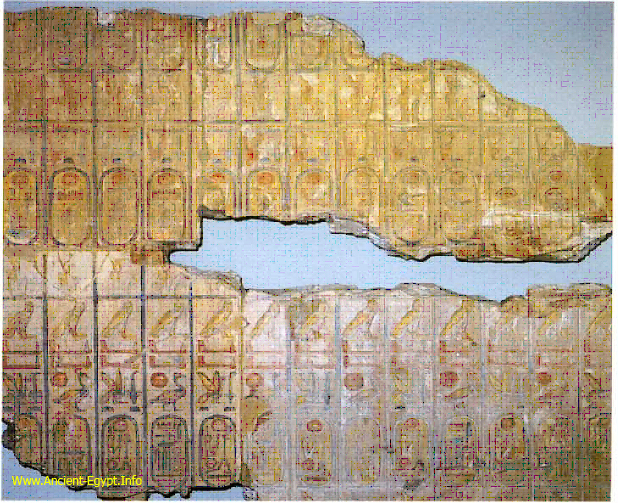 The finest record of the chronology of the Egyptian kings is unfortunately the most damaged and now incomplete. It is a papyrus known as the Royal Canon of Turin, in which museum it is to be found. Originally the property of the king of Sardinia, tragically, it was badly packed and severely damaged during transportation. 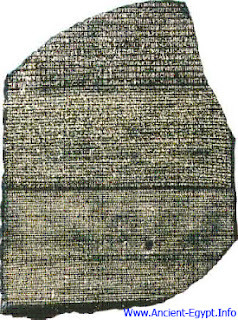 The list of the kings, originally over 300 of them, is written in a fine literate hand in the hieratic script on the back of a long Ramesside papyrus which has accounts on the front, or recto side. This dates it to having been written about 1200 BC. Like the scraps remaining from Manetho, and the first line of the Palermo Stone, it begins with dynasties of gods which are followed by those of earthly kings. A useful aspect is that it gives the exact lengths of each reign in years and even months and days. Its condition is such that piecing the fragments together is like solving a gigantic jigsaw puzzle with many pieces missing, so that what would have been the premier source for Egyptian chronology is an epigraphist's nightmare. Seti I and his young son, the future Ramesses II, worship the cartouched names of their ancestors in the Hall of Ancestors or Records in the temple of Abydos. Unacceptable ancestors such as Queen Hatshepsut and the 'Amarna' pharaohs (pp. 120-39) are conveniently omitted from the list. The discrepancy between the Egyptian civil year of 365 days and the true year of 365% days led to some curious anomalies. One inscription from the reign of Amenemhet III (1842-1797 BC) records a visit by the king’s treasurer Harurre to Serabit el-Khadim, in Sinai, to extract turquoise ore in the third month of what was, according to the civil calendar, winter. However, the actual weather conditions prevailing were those of high summer because the calendar was some seven months out, and Harurre records how he and his men suffered badly from ‘the mountains that brand the skin’ with the very great heat. As a Ramesside papyrus records in the 13th century BC, ‘Winter is come in Summer, the months are reversed, the hours in confusion’. From an incomplete and variously corrupt literary history it is possible to examine some of the actual written sources. Whilst these had survived from ancient Egyptian times, after about the end of the 4th century ad they could no longer be read. The latest dated inscription in Egyptian hieroglyphs occurs on the temple of Philae in ad 394. Thereafter the 'key' was lost although many scholars during the European Renaissance, and later the Jesuit priest Athanasius Kircher (1602-80), made valiant attempts at decipherment, often with incredible results. In 1761 another priest, the Abbe Jean Jacques Barthelemy, published a paper in which he suggested that the oval rings in which a number of the hieroglyphic signs occurred enclosed royal names. It was working from those 'ovals', now called cartouches, that Jean Francois Champollion was able to 'crack the code' of Egyptian hieroglyphs with the Rosetta Stone. This odd-shaped slab of black basalt was found by a French officer of engineers, Lieutenant P.F.X. Bouchard, serving with the Napoleonic Expedition in Egypt, at Fort Julien at the Rosetta mouth of the Nile in 1799. It is inscribed in three scripts representing two languages. The upper portion is written in Egyptian hieroglyphs, the centre in the Egyptian demotic script, and the lower section is in Greek. The latter was easily translated, revealing that the inscription, the Decree of Memphis, is a decree of Ptolemy V, dated to Year 9 of his reign, 196 BC. With this as a base Champollion was able to work toward his eventual epoch-making paper, Lettre a M. Dacier, in 1822 which opened the floodgates to the decipherment of Egyptian hieroglyphs. [Above] The Rosetta Stone is perhaps one of the most famous antiquities in the world. It passed to Britain under Article 16 of the Treaty of Alexandria, 1801. By comparing the cartouche of Ptolemy on the Stone with the cartouche of Cleopatra on the Philae obelisk at Kingston Lacy, Dorset, Champollion was able to identify several coincidental letters, forming the basis of his decipherment. British Museum. Apart from priestly inscriptions such as the Rosetta Stone, the Shabaka Stone (p. 192) and others such as the Sehel boulder inscription No. 81 (p. 33), there are only a few sources with actual lists pertaining to Egyptian history and chronology. References to small, specific areas of chronology, often only reflecting an individual's part in it, occur, but the evidence is slight and often difficult. 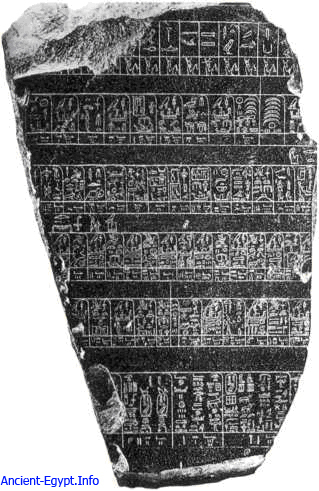 (Above) A section of the Palermo Stone (17 inches high, 9% inches wide or 43.5 x 25 cm). It is thought that originally this monument was just over 6Vi ft (2 m) long and about 23Vi inches (60 cm) high. It is laid out in a series of boxes which give the king's name and then the events of that reign by numerical year (like the dating of laws by regnal year in England). Thus we find entries under a king's name, such as 'Year 4 First Occurrence of the Feast of Sokar. Similar dating by year and events occurs on a number of the small ivory labels from Abydos and Saqqara that were tied to individual items such as sandals (pp. 22, 24). Palermo Museum, Sicily. The earliest evidence surviving is the Palermo Stone, which dates from the 5th Dynasty (2498-2345 bc). One large section of this black diorite slab is in the Palermo Museum in Sicily and smaller fragments are in the Cairo Museum and the Petrie Museum, University College London. The Palermo fragment is inscribed on both sides and records some of the last Predynastic kings before 3150 bc followed by the kings through to Neferirkare in the mid-5th Dynasty. The Royal List of Karnak (now in the Louvre) has a list of kings running from the first king down to Tuthmosis III (1504-1450 BC). It has an added advantage in that it records the names of many of the obscure kings of the Second Intermediate Period (Dynasties 13-17). The Royal List of Abydos is still in situ on the walls of the corridor in the Hall of Ancestors in the magnificent temple of Seti I (1291-1278 bc). 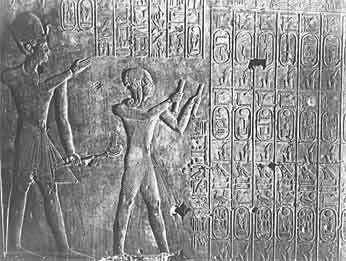 It shows Seti with his young son (later Ramesses II) before a list of the cartouches of 76 kings running in two rows from the first king to Seti I (the third row of cartouches on the wall beneath these merely repeats Seti's own). The kings of the Second Intermediate Period are not given (hence the value of the Karnak List, above), neither are there the cartouches of the kings at the end of the 18th Dynasty after Amenhotep III, who were not considered acceptable because of their association with the Amarna 'heresy' (Akhenaten, Smenkhkare, Tutankhamun and Ay: see pp. 120-139). A badly damaged duplicate of this list, but arranged in three rows instead of two, was found in the nearby temple of Ramesses II. Known as the Abydos King List, it is now in the British Museum. The Abydos King list in the British Museum is a much inferior duplicate of the larger Royal List (p. 12) in the Hall of Ancestors or Records in the temple of Abydos. One other list inscribed on stone is the Royal List of Saqqara, now in the Cairo Museum. It was found in the tomb of the Royal Scribe Thunery at Saqqara and has 47 cartouches (originally it had 58) running from Anedjib of the 1st Dynasty to Ramesses II, again omitting those of the Second Intermediate Period. Manetho's Egyptian History (also known as Notes about Egypt) gives us the basic structure or skeleton of Egyptian chronology that we use today. He divided Egyptian history into dynasties (essentially, ruling houses) and we recognize 30 of them from the unification of Egypt in c. 3100 BC down to the death of the last native Egyptian pharaoh, Nectanebo II, in 343 BC. Sometimes the last phase of ancient Egyptian history after this date has two dynasties added - the 31st and 32nd - which are the Second Persian Period, and the Macedonian rulers linked with the Ptolemaic Dynasty, which ends with the suicide of the last of the Ptolemies, Cleopatra VII, in 30 BC. Curiously, although great reliance is placed on Manetho, no full text of his work survives. Perhaps one day a papyrus edition will be found, possibly coming from one of the cities of the Faiyum which have produced so much literary and historical material on papyri from the Graeco-Roman period. Manetho's History is known to us only by chance since it was highly thought of in antiquity and several writers whose works have survived quoted extensively from it. Principal amongst these was Josephus (writing in the late 1st century AD), in his Jewish Antiquities and Contra Apionem, and the Christian chronogra- phers Sextus Julius Africanus, whose Chronicle comes down to c. AD 220, and Bishop Eusebius of Caesarea, whose writings add another 100 years into the early 4th century. Some 500 years later, the work of the last two writers was used as a basis for a history of the world by George the Monk who was secretary (hence his also being known as Syncellus) to the Byzantine Patriarch Tarasius (784-806). All these authors took what they wanted for their own purposes from their sources and so Manetho's account only exists in fragments within these later works. Manetho's sources were very mixed. He obviously had access to temple records, since we know that he was a priest in the temple at Heliopolis (the Biblical city of On). His name itself has overtones of learning because it appears to be associated with Thoth, the ibis-headed god of wisdom who invented hieroglyphs. It may mean 'Beloved of Thoth' or possibly 'Gift of Thoth'. 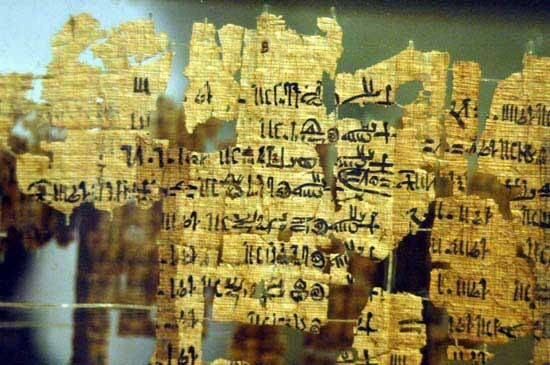 He had sources such as the official papyrus histories, the sacred books in the temple and, not least, the historical inscriptions on the temple walls such as the king lists described below, Ramesses Ill's account of his battles with the Sea Peoples at Medinet Habu, and many more that have not been preserved. To all these possible sources, however, he added a lot of popular traditions and stories of the kings, some of which are far from credible. He was also, obviously, conversant with the writings of Herodotus, the Greek historian from Halicarnassus, who had visited Egypt around 450 BC and written much about the land and its history in Book 2 of his History. Manetho lived during the reign of Ptolemy I, Governor and Satrap of Egypt from 323 to 305 and king from 305 to 282 BC. Plutarch tells us that Manetho was one of the two priestly advisors to the king and that he had been concerned with the introduction of the cult of Serapis. This god, represented as a bearded man with a corn modius (measure) on his head, was a conflation of Egyptian and Greek ideas which had wide appeal and whose cult, under Rome, spread as far as Roman York (Corpus Inscr. Lat. VII, 240). Alexandria was noted for its temple to Serapis with the famous cult statue by the sculptor Bryaxis, introduced into the temple about 286 BC, as well as for its later Library and also being the burial place of Alexander the Great. Manetho’s association with the foundation of the cult may be acknowledged by the appearance of his name on a statue base found in the temple of Serapis at Carthage (CIL VIII, 1007); it may have been a portrait bust of him, but we shall never know. Even with the chronological information available, as outlined above, it may come as a surprise to realize that it is extremely difficult to fix true or absolute dates in Egyptian chronology. Most of the information given in the inscriptions mentioned is relative, in that it shows a sequence of kings relative to each other with sometimes a length of time between each reign, but to fix them in an absolute framework is a different matter altogether. Absolute dates from ancient Egypt rely on astronomical dating. 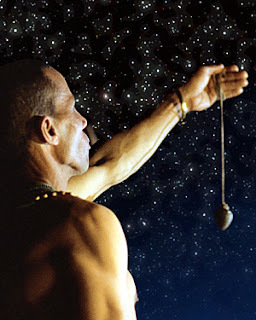 This is done by reference to the civil and astronomical calendars in a complicated calculation involving the Sothic cycle of 1460 years, based on the heliacal rising of Sirius, or Sothis, the 'dog star'. The ancient Egyptians knew that the year consisted of 365 days, but they made no adjustment for the additional quarter of a day each year - as we do with Leap Year every four years at the end of February. Hence their civil and astronomical calendars were gradually moving out of synchronization and could bring about extremes of dating between the two. Eventually, every 1460 years, the two calendars coincided and were correct for a short time, until they gradually became out of step again until the end of the next cycle. The heliacal rising of Sirius was, ideally, supposed to coincide with New Year's Day in the civil calendar, but did so only every 1460 years. The 3rd-century AD grammarian Censorinus records that in AD 139 the first day of the Egyptian civil year and the heliacal rising of Sirius did actually coincide - this being the end of a Sothic cycle. This phenomenon is also confirmed by a reverse type on the billon tetradrachms issued at the mint of Alexandria with the standing figure of a haloed phoenix and the Greek word AION (indicating the end of an era); it is also dated by the characters L B to regnal year 2 of the emperor Antoninus Pius, which fell between 29 August AD 138 and 28 August 139. It is possible, working backwards, to deduce that comparable coincidences had occurred in 1317 BC and 2773 BC. The occurrence of a heliacal rising of Sirius is recorded in the 7th year of the reign of Senusret III (1878-1841 BC) of the 12th Dynasty. The event is dated to the 16th day of the 4th month of the 2nd season in the 7th year of the king. (There were only three seasons, not four, in ancient Egypt: inundation, sowing and harvest; then the cycle started again.) By calculating from the 'coincidences' of 1317 BC and 2773 BC, this rising can be fixed at 1872 BC. Another such sighting recorded occurred on the 9th day of the 3rd month of the 3rd season in the 9th year of Amenhotep I (1551-1524 BC); this produces a date somewhere within a 26-year range in the second half of the 16th century BC, since it cannot be quite so closely tied as the Senusret date. This shows just how fluid Egyptian chronology can be, essentially calculated on a structure of regnal years for each king (where known) and which, by counting backwards and forwards, are basically anchored to the three heliacal risings of Sirius mentioned. It is generally accepted that Egyptian chronology is on a firm footing from 664 BC, the beginning of the 26th Dynasty (Saite Period) and the reign of Psammetichus I. There are then outside links to the chronology of historical Mediterranean civilizations which become firmer as the full classical and Roman periods are reached. Margins of error in the dynasties prior to the 26th are variable; whilst in the New Kingdom 20 years might be acceptable, this will increase as earlier periods are reached so that dates around the unification and in the Early Dynastic Period (Dynasties 0-2) could be subject to fluctuations of anything between 50 and 200 years. Some recent literature, both scholarly as well as ‘fringe’, has suggested outlandish and unacceptable changes in the chronology. Principal amongst the former is Centuries of Darkness by Peter James (1991), and amongst the latter the books of Velikovsky and Von Daniken. It is small wonder then that there is often such a variety in the dates suggested in much of the literature. In this book the dating followed is largely that put forward by Dr William J. Murnane in his Penguin Guide to Ancient Egypt (1983). The Montazah Palace, formerly the residence of Farouk, is surrounded by a large garden, with a number of other buildings standing nearby. The palace itself has been converted into a museum, and one of the buildings in the grounds is now a casino. The walls of the galleries in the three-story palace are hung with pictures, some depicting love scenes from the Middle Ages. 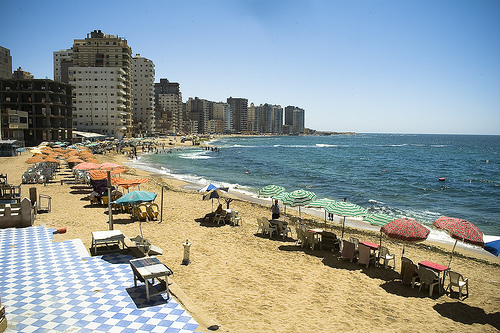 Twelve miles east of the Montazah Palace lies the El Mamura coast, where Sadat has his country retreat. I was fortunate on one occasion to interview the president’s wife, Jehan, there. My real objective was an interview with the president himself, and I had hoped that I could somehow persuade Madame Sadat to intercede with him on my behalf. It was by appealing to Madame Dewi, the wife of Sukarno, that I managed to get an interview with him in Jakarta in 1965, and I was hoping to be as fortunate in securing an interview with the president of Egypt. My interview with Madame Jehan Sadat took place over tea at a table on the beach. I noticed from the marks on the teacups and napkins that the Sadats were using the Palestine Hotel, which overlooks the sea at El Montazah, to do their catering. I found it very difficult to raise the subject of an interview with the president, and only managed to hint at my real intention at the very end of the interview by saying, “I hope most sincerely that the next time we meet, you will be accompanied by your husband the president.” But Madame Sadat merely acknowledged this with a polite “Thank you.” During my stay in Egypt, I always regretted not asking her more directly to help arrange an interview with the President. Madame Sadat is a tall, beautiful women, with a little English blood in her. I can see her now as I write, her hair floating in the sea breeze. The place where we had tea was sheltered from the sea by a fence so that it is impossible for anyone to peek into the house from the sea. 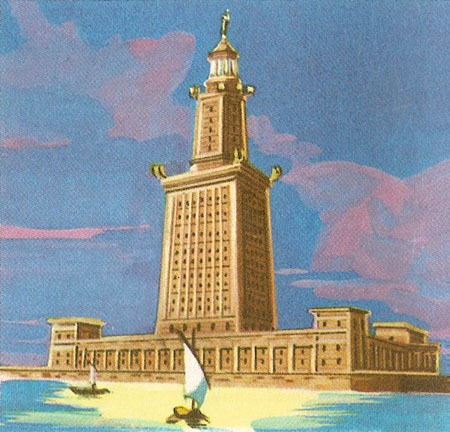 Pharos | How and why did the lighthouse and the island disappear ? How and why did the lighthouse and the island disappear ? Strangely enough, the answer appears only in legends. The lighthouse continued to fulfill an important military function after Egypt was conquered by the Islamic armies. As part of a carefully thought out plot, a rumor was circulated during the days of the Christian emperor, Constantinople, that a great hoard of treasure had been hidden beneath the lighthouse. In their lust for the treasure, the Arabs began to dismantle the lighthouse, only to realize halfway through the prodigious task that the rumor had been a ruse. They reconstructed the lighthouse but as they were replacing the mirror-stone, they dropped it from the top of the tower. It broke and was never replaced. The rest of the demolition was completed by nature. During the thirteenth century, the area was hit by a terrible earthquake and what remained of the lighthouse and the island disappeared into the sea. Nevertheless, the Great Lighthouse of Pharos is remembered today in a less tangible, but perhaps more enduring form in the words for “lighthouse” which are “pharos” in English, “phare” in French, and “faro” in Spanish and Italian. But this is the only testament indicating that the greatest lighthouse in the world stood here. On the western point of the harbor, directly opposite Qaitbei, stands the Ras-el-Tin Palace, once the residence of King Farouk, the so-called Last Pharaoh of Egypt. When the revolution was initiated on July 23, 1952, King Farouk was staying in the Montazah Palace, about ten miles to the east of Ras-el-Tin. The drama of the revolution surrounding the king in Alexandria is an extremely human one, and one that I personally find fascinating. Farouk was roused a little after one o’clock in the morning by a close and loyal friend, and the king immediately began the drive to Ras-el-Tin. Cannon on the Qaitbei Road were already aimed at the palace. The king made a request to both the British and American ambassadors for assistance to put down the coup d’etat, but he received no reply. By this time, General Naguib and Colonel Sadat (now President Sadat) were ready to enter Alexandria. Opinion within the army itself was divided on the question of whether to capture the king and execute him. Nasser, who spearheaded the revolution and who remained behind in Cairo, feared that the execution of the king would trigger a blood bath. With the words “History will sentence him to death,” Nasser sent him into exile and won the approval the people. As the ship went through the harbor, all the boats sounded their sirens in a final salute, and a frigate, the Malik Farouk, sounded a twenty-one-gun salute. It’s hollow echo across the bay was the final concession from Naguib to the departing king. The abdication of Farouk brought to an end the dynasty of Mohammed Ali, which was initiated at the beginning of the nineteenth century. Along Comiche Road, in the opposite direction of Farouk’s final drive from El Montazah to Ras-el-Tin, are the crowded beaches of Stanley, San Stefano, Ramleh, Sidi Bishr and El Mandarah. 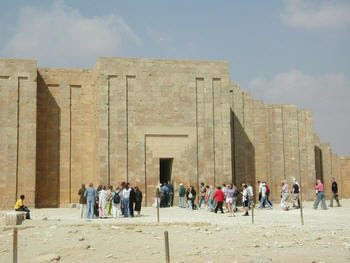 Halfway along the road is an area called Cleopatra, which is where this famous queen had a palace and a temple. It is now a yachting and fishing club. Most Westerners think of the name Cleopatra as being synonymous with a beautiful woman. In Egypt today, “Cleopatra” is the name of a well-known, locally produced cigarette. Apparently the Egyptians themselves think of Nefertiti as the epitome of beauty. She was the wife of Pharaoh Akhenaton and was certainly a strikingly beautiful woman. Souvenir shops abound with plates and trays carrying her likeness and ornaments made in the shape of her silhouette. The original bust of Nefertiti was excavated at Tell-el-Amama in central Egypt and is now one of the prized exhibits of the Dahlem Museum in West Berlin. In both New York and London are obelisks known as Cleopatra’s Needle. In fact these monuments have nothing to do with Cleopatra. They were originally set up at Heliopolis, near present-day Cairo Airport, as monuments to victorious battles during the era of Thothmes III (1504-1450 B.C.). Following the death of Cleopatra, the Romans transferred the obelisks to Alexandria to enhance the beauty of the city, and it was then that each acquired the name Cleopatra’s Needles. The story of Cleopatra, her beauty and majesty, was well known outside Egypt, and thinking these obelisks had some fundamental connection with the queen, they were carried off by American and British expeditions to Egypt in the nineteenth century and set up in New York and London respectively. Egypt is a land of extreme geographical contrasts, recognized by the ancient Egyptians in the names that they gave to the two diametrically opposed areas. The rich narrow agricultural strip alongside the Nile was called Kmt, 'The Black Land', while the inhospitable desert was Dsrt, 'The Red Land'. 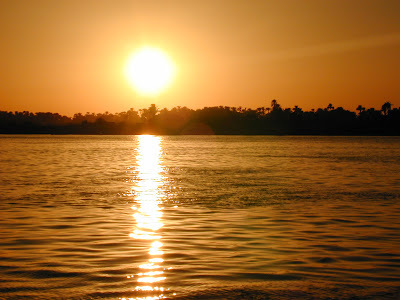 Often, in Upper Egypt, the desert reaches the water's edge. There was also a division between the north and the south, the line being drawn roughly in the area of modern Cairo. To the north was Lower Egypt where the Nile fanned out, with its several mouths, to form the Delta (the name coming from its inverted shape of the fouth letter, delta, of the Greek alphabet). To the south was Upper Egypt, stretching to Elephantine (modern Aswan). The two kingdoms, Upper and Lower Egypt, were united in c. 3100 BC, but each had their own regalia. The low Red Crown (the deshret) represented Lower Egypt and its symbol was the papyrus plant. Upper Egypt was represented by the tall White Crown (the hedjet), its symbol being the flowering lotus. The combined Red and White crowns became the shmty. The two lands could also be embodied in The Two Ladies, respectively the cobra goddess Wadjet of Buto, and the vulture goddess Nekhbet of Nekheb. Egyptian civilization was one of the greatest in the ancient world, and certainly the most long lived, lasting for more than 3000 years. In the popular mind the immediate images are those of the pyramids, the great Sphinx at Giza, the enormous temples and the fabulous treasures that have been preserved in the dry sand of Egypt. But what of the people who were responsible for such splendours? Copper alloy kneeling statuette of Amenemhet III (1842-1797 BC), part of a rare group of figures in this metal of the king, his wife and chief scribes. George Ortiz Collection, Geneva. The ancient Egyptian pharaohs were god-kings on earth who became gods in their own right at their death. They indeed held the power of life and death in their hands - their symbols of office, the crook and flail, are indicative of this. They could command resources that many a mod- ern-day state would be hard pressed to emulate. One has only to conjure with some statistics to realize this. For example, the Great Pyramid of Khufu (Cheops) at Giza, originally 481 ft (146 m) high and covering 13.1 acres (5.3 hectares), was the tallest building in the world until the 19th century AD, yet it was constructed in the mid-3rd millennium BC, and we still do not know exactly how it was done. Its base area is so vast that it can accommodate the cathedrals of Florence, Milan, St Paul's and Westminster Abbey in London and St Peter's in Rome, and still have some space left over. The vast treasures of precious metal and jewellery that, miraculously, escaped the attentions of the tomb robbers are almost beyond comprehension. Tutankhamun's solid gold inner coffin is a priceless work of art; even at current scrap gold prices by weight it would be worth almost £1 million ($1.5 million), and his gold funerary mask £105,000 ($155,000). He was just a minor pharaoh of little consequence - the wealth of greater pharaohs such as Ramesses II, by comparison, is unimaginable. The names of other great pharaohs resound down the centuries. The pyramid-builders numbered not merely Khufu, but his famous predecessor Djoser - whose Step Pyramid dominates the royal necropolis at Saqqara - and his successors Khafre (Chephren) and Menkaure (Mycerinus). Later monarchs included the warriors Tuthmosis III, Amenhotep III, and Seti I, not to mention the infamous heretic-king Akhenaten. Yet part of the fascination of taking a broad approach to Egyptian history is the emergence of lesser names and fresh themes. 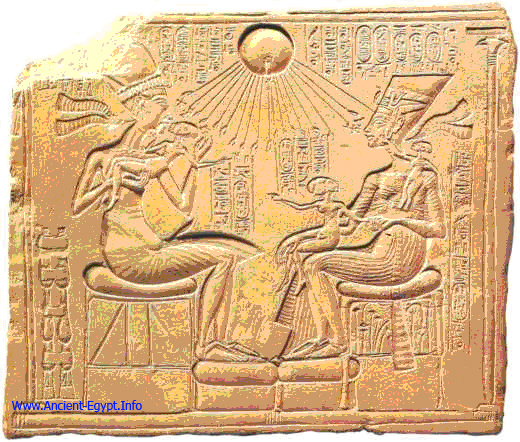 The importance of royal wives in a matrilineal society and the extent to which Egyptian queens could and did reign supreme in their own right - Sobeknefru, Hatshepsut, and Twosret to name but three - is only the most prominent among several newly emergent themes. 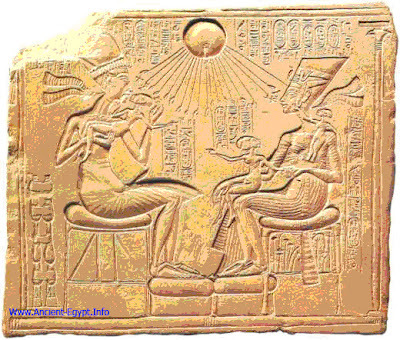 The royal family: the 18th Dynasty king Akhenaten (1350-1334 BC) and his queen Nefcrtiti with three of their six small daughters. The intimacy of the scene is unprecedented in earlier Egyptian art. Berlin Museum. The known 170 or more pharaohs were all part of a line of royalty that stretched back to c. 3100 BC and forward to the last of the native pharaohs who died in 343 BC, to be succeeded by Persians and then a Greek line of Ptolemies until Cleopatra VII committed suicide in 30 BC. 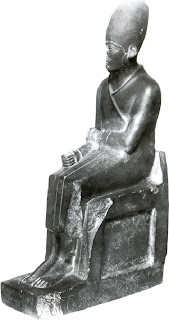 Following the 3rd-century BC High Priest of Heliopolis, Manetho - whose list of Egyptian kings has largely survived in the writings of Christian clerics - we can divide much of this enormous span of time into 30 dynasties. Egyptologists today group these dynasties into longer eras, the three major pharaonic periods being the Old, Middle and New Kingdoms, each of which ended in a period of decline given the designation 'Intermediate Period'. Ramesses II (1279-1212 BC), in a typically aggressive pose, grasps a trio of Asiatic prisoners by the hair, ready to despatch them with the incongruously small axe held in his left hand. 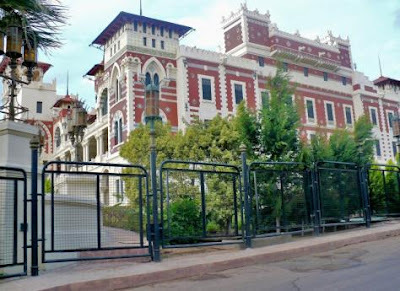 Cairo Museum. In Chronicle of the Pharaohs, that emotive and incandescent 3000-year-old thread of kingship is traced, setting the rulers in their context. Where possible, we gaze upon the face of pharaoh, either via reliefs and statuary or, in some rare and thought- provoking instances, on the actual face of the mummy of the royal dead. Across the centuries the artist's conception reveals to us the god-like complacency of the Old Kingdom pharaohs, the careworn faces of the rulers of the Middle Kingdom, and the powerful and confident features of the militant New Kingdom pharaohs. Such was their power in Egypt, and at times throughout the ancient Near East, that Shelley's words, 'Look on my works, ye Mighty, and despair! ', do indeed ring true as a reflection of their omnipotence. Many books are published each year on ancient Egypt, on different aspects of its history and culture. Here, for the first time, an overall view is taken of those incredible people, the pharaohs who, although human after all, were looked upon by thousands as gods on earth and whose very achievements were, and even today still appear to be, the creations of the gods themselves.